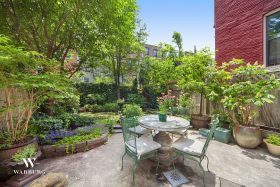 Designed in 1889 by William M. Miller, a prominent architect for Cornell University during the late 1800s, this stately, single family home is located in the charming Prospect Lefferts Gardens Historic District, one block from Prospect Park. 52 Midwood Street is a 20-foot-wide home with almost 3,800 square feet on a deep, 100-foot lot asking $2,750,000. Totally renovated, the house perfectly blends old and new bringing together quintessential Brownstone Brooklyn charm with all the modern conveniences.